2014 KTM 125 EXC. Picture credits - KTM. Submit more pictures. The 125 EXC is the ideal machine for youngsters in the E1 class and all those seeking ultra-easy handling, minimum weight plus the lowest acquisition and maintenance costs. The renowned high performance is regarded as the two-stroke benchmark in the E1 class. Driveline: 14:50 (13:50). Primary drive: 23:73. 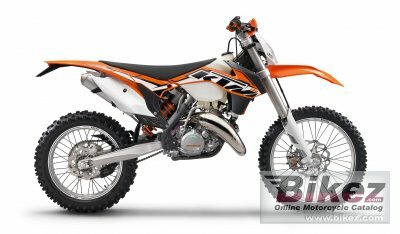 Ask questions Join the 14 KTM 125 EXC discussion group or the general KTM discussion group.